BEST COLOUR SUIT FOR CORPORATE AND SALES JOB? 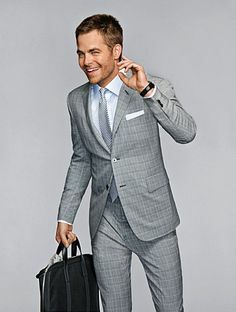 Hey guys, Dan Thomas from Image Doctor and Improvemant.com and watch the video above or read the article below to learn the answer to the common men’s style question of the BEST COLOUR SUIT FOR CORPORATE AND SALES JOB ? Colours can be very powerful in the unconscious signals that they send and I want you to have an open mind as I discuss the different suit colours and how I feel each can impact on the presence you create in the work place. Much of the information may seem strange to your present, conscious mind, but it’s actually the unconscious mind that takes in and deciphers the colour signals it receives, so let’s jump into this content with an open mind and hopefully you learn a few things that will help you better answer the question what colour suits should I wear to work? Many younger men coming out of school or university or older men changing careers and moving into the corporate world often default to black suits because they feel it’s a safe colour and the easiest to match with a variety of colours. A black suit or tuxedo is worn commonly for formal events like balls, galas, awards shows and black tie events. On these occasions when all attendees are dressed in black, there is a certain element of glamour and sophistication that comes with this choice of colour. In my opinion though, a black suit in the corporate world brings with it messages that are more dominant and authoritative rather than sophisticated and glamorous. Black can send signals that you are less approachable and even intimidating so if you do hold a more senior position within a company and have staff that report to you, a black suit is certainly appropriate within the corporate world. If your position requires you to assert your dominance and cement your position as an authority figure, the black suit will be an appropriate suit colour choice for you. But if you hold a less senior role in which you don’t manage any staff or your position involves regular interaction with clients and customers, I believe that the black suit is not the wisest colour choice for you. If you consider how often the villian in a movie or TV show is dressed in black outfits, you can see how this colour choice may send unconscious signals that are not in alignment with your seniority at work or your objectives in building trust and rapport with customers and existing or potential clients. 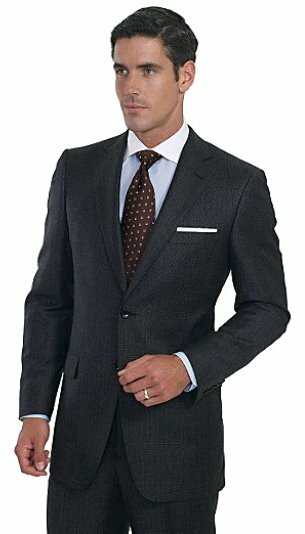 Navy and charcoal suits are the most recognised and trustworthy suit colours in business and client settings. Navy is a true power colour worn universally by presidents, politicians and high level CEO’S and executives. Navy is seen as professional, yet approachable, works with all skin complexions and is a great base colour to mix with a variety of colours when pairing dress shoes, dress shirts, ties and pocket squares. Various studies involving HR and recruitment representatives, as well as high level executives who perform interviews for new hires and job promotions have reported that the best choice of suit when interviewing is the navy suit. A charcoal suit sends a message of being rock solid, wise and reliable. Charcoal is a bit more understated, so depending on your industry and the clients you deal with, charcoal can remain understated by pairing with plain, solid dress shirts and ties like white, grey, navy and black. But can then be a great base colour to add warmer, brighter colours and patterns depending on the environment and message you are wanting to send. Charcoal is equally as suitable as the navy suit when it comes to the versatility it offers in the workplace and the strong and professional impression the colour creates. Outside of the Navy and Charcoal suit, the next most appropriate corporate colour is dark grey. Whilst dark grey is slightly more relaxed than the charcoal suit, it will still send similar messages of maturity, dependability and a serious approach to the task at hand. So to recap, the suit colours that are most appropriate in corporate settings are Navy, Charcoal and Dark Grey. We discussed the fact that black is more formal, so this leaves the other common suit colours of mid grey, light grey and blue suits. Whilst I feel all these colours have a place in the corporate world, I believe their place is more so within the confines of the office and in the presence of your colleagues and current clients whose trust and credibility you’ve well and truly gained. I don’t believe these colours will create first impressions that are as strong and professional as those created when wearing the navy or charcoal suit during these important meetings. I would also advise that a medium grey, light grey and blue suit should not be worn on occasions when you’re meeting with new or potential clients for the first time, attending a job interview or a meeting to discuss a promotion. Today’s post was covering the most common suits which are all colours I feel have a place within the corporate world. There are obviously a variety of other suit colours available but when you are asking the question what colour suits should I wear to work?, I don’t believe the remaining colours hold an appropriate place in the workplace. So hopefully today’s video has left you with a better idea of what would be the most appropriate coloured suit to wear in the workplace and you feel more confident when it comes to making this choice yourself.